In the Percy Smock Corner on his The Classic Typewriter Page, Richard Polt lists resources for the modern-day typewriter collector. Smock (real name Percival Edward Schmauch) was a post-war collector in Redwood City, California, and Richard has dedicated the corner in his honour as he "was collecting typewriters back when only eccentrics would do such a thing". Never were more true words written. 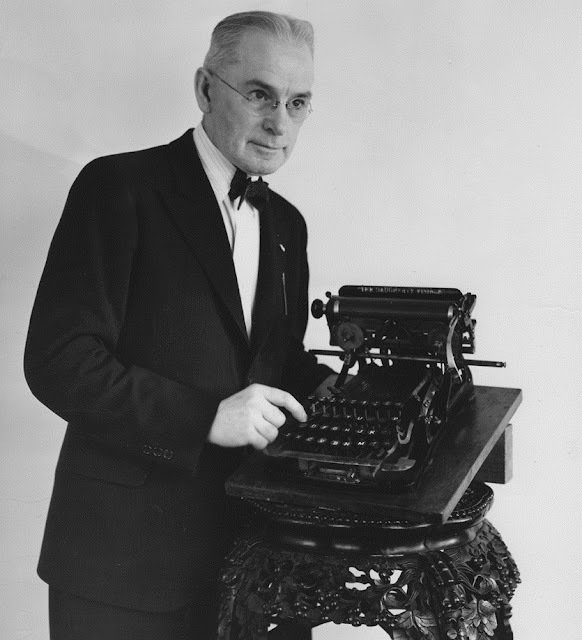 Smock and Carl Praetorius Dietz were the two most famous American typewriter collectors in the 40 years from 1934-74 (Dietz died in 1957 and Smock in 1979). And "eccentric" is, if anything, an understatement in describing these two pioneering gentlemen. Carl Dietz, for example, was a singer-songwriter who travelled the US at the turn of the century as comedic vocalist T. Addison Wade with the Wilbur-Kirwin Light Opera Company, playing leading man roles opposite the prima donna and owner Susie Kirwin. 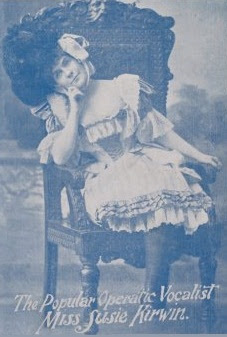 Dietz then joined the Murray-Hart Repertory Company as a juggling clown, the Jolly Juggler who tossed and caught a cavalryman’s boot, a ball and a bushel basket. 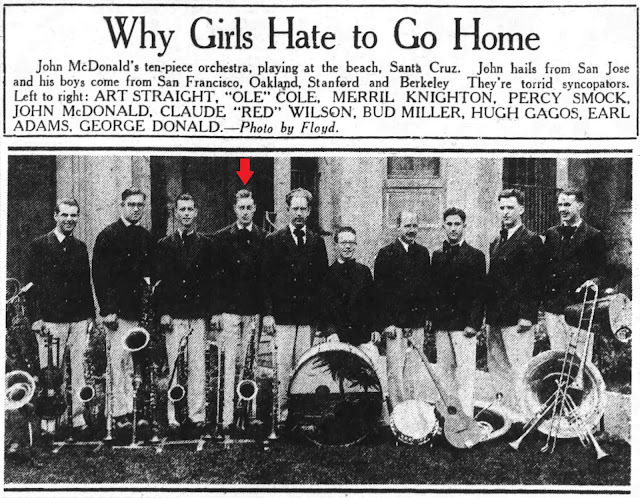 Percy Smock, for his part in the eccentricities of the early typewriter collectors, was in the late 1920s a drummer in pianist John McDonald's 10-piece "peppy music" orchestra, playing at dances and beach concerts in California. Though working by day as a typewriter salesman and mechanic in San Jose, Smock had managed to travel the world with various bands, and had played at the Krazy Kat Café in Sydney, Australia, in Suva, Fiji, and at the Silver Dragon Café in Honolulu. He was later a member of the Santa Cruz Magic Club, a magician known to perform card and rope tricks. Smock was also a singer and was still playing drums with San Mateo orchestras into the early 1960s. It was written that Smock "knew his South Seas and his traps". There were traps for beginners, too, when Dietz put down the juggled plates and hit the road in search of old typewriters. Dietz must have felt like the solitary example of a very rare breed indeed when he first began to travel the highways and byways of America on his typewriter quest in 1934. That is, until he reached Detroit on this day 80 years ago, for the 1936 Great Lakes Seaway Conference, and met there the Canadian typewriter salesman and collector Byron Alexander Haining. Haining, born in Saint John, New Brunswick in 1892, was still working for the American Writing Machine Company, famous for having been established by George Washington Newton Yost and James Densmore on January 12, 1880, to produce the Caligraph typewriter, the first competitor to the Remington (this venture was backed by Edward Mead Johnson of Johnson & Johnson fame). By 1906, when it stopped production of the New Century Caligraph, the once proud AWMC had been reduced to rebuilding typewriters for the Union Trust. 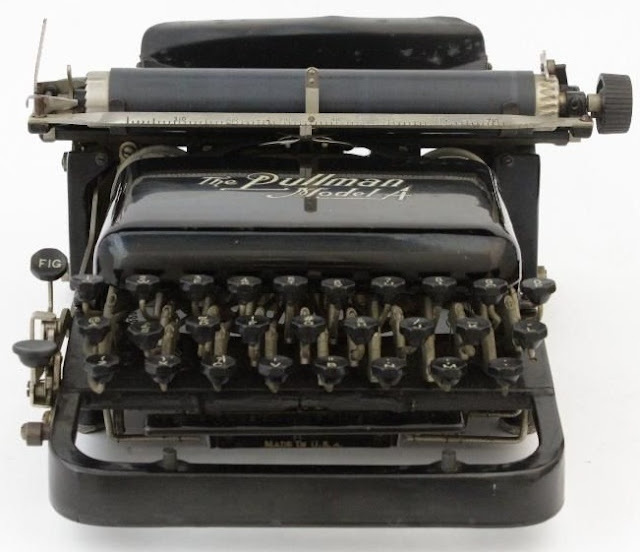 In 1919 it started to distribute the Century 10, a redesigned Remington Junior, but by 1923 its one remaining role was in finding typewriters to rebuild. 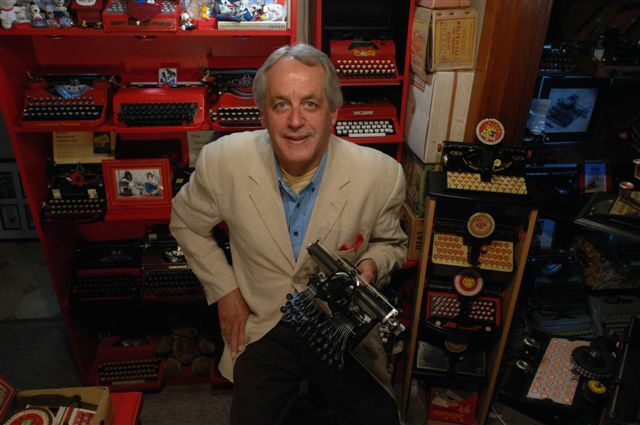 Haining's job when Dietz met him in Detroit was to seek out and buy standard-sized and portable typewriters for rebuilding - but Haining also kept his eye open for much older machines, for his own private collection. One machine in particular, an original 1881 Caligraph, had come to his notice in Detroit in 1932. Thought to be the first typewriter ever produced by the AWMC, it was at that time owned by a typewriter salesman called Norman F. Whiting, who had a store on Michigan Avenue. Whiting kept the Caligraph "practically hidden", on a top shelf, presumably for display purposes more than anything else - he claimed he had a "sentimental" attachment to it. When Henry Simler (1876-1954), AWMC's president (later famous as the founder of the Forty Plus Club of New York City) came to visit Haining and was told of Whiting's Caligraph, Simler decided such an historically important item should be in the possession of the AWMC and displayed at the AWMC's office at 1133 Washington Boulevard. Simler and Haining hatched a plan to secure the typewriter, the success of which came down to a plea on the grounds of its heritage value. Four years later, when Haining triumphantly showed Dietz the Caligraph, Dietz doubted it was the first one made, but told Haining, "It looks like an 1881, but you'd be safe in calling it an 1880". In fact, while the company was formed in 1880, its first typewriter didn't appear until 1881, so Dietz was right. 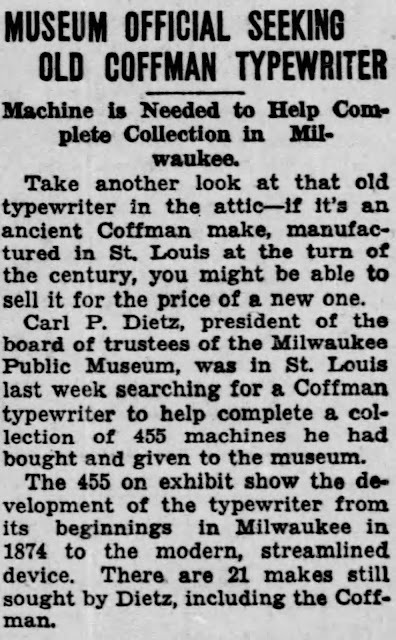 By the time of his visit to Detroit in March 1936, Dietz had accumulated 274 typewriters in two years, and by April 1942, when he arrived in St Louis looking for a Coffman, the collection had risen to 455 - he was in search of just 21 more (including the Coffman; the Dietz Collection in the Milwaukee Public Museum, opened with 315 machines on March 21, 1937 - still 15 short of Dietz's target - now has 876 items). Dietz, as was generally the case, had success, and a Coffman was duly added to his collection. His method was often to hunt in the "place of origin", and in this he set an example for so many latter-day typewriter collectors. Another thing employed by modern collectors is the swap. 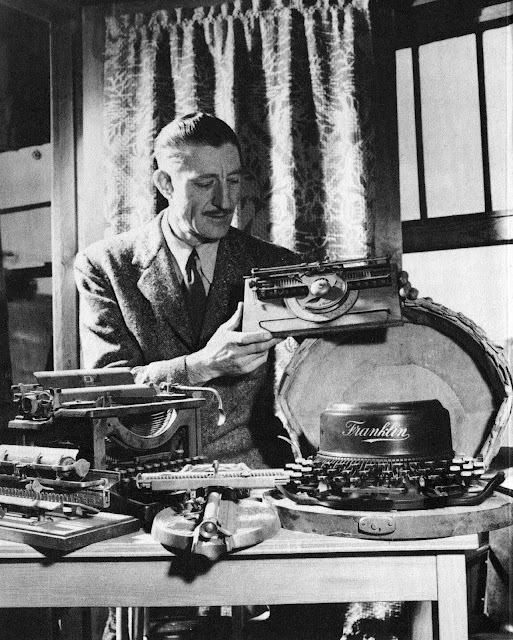 In May 1938 Dietz swapped 14 US typewriters of which he had duplicates for 10 old German typewriters, in an exchange he organised with Arthur Brehm, a director of the Wanderer-Werke AG in Siegmar-Schönau. Later that same year Dietz was in Winnipeg, Canada, "just for his hobby". Like those who so avidly followed in his path, Dietz was known to go digging in attics, second-hand stores, salvage shops and junkyards. Dietz decided to start his collection upon spotting a Columbia Bar-Lock in a shop window in San Diego. He was drawn to it because it was the same model as the one he had used in 1892, as a 17-year-old, testing it for his boss in a law office in San Francisco. Unfortunately, this Bar-Lock had already been sold, but Dietz steeled himself to find another. On a trip returning from Illinois, he came to a crossroads - one highway led to Elgin, the other to Woodstock, where he had intended to go. But on a hunch Dietz headed for Elgin, and in the first typewriter dealer's shop he came across he found his Bar-Lock. Such determination was to be rewarded more than 400 times. the fateful decision to drive to Elgin insead of Woodstock. After the Bar-Lock came a Pullman, spotted in a store beside the Tuscon, Arizona, railway station. In a Pittsburgh shop basement, under a pile of discarded machines, Dietz uncovered his first Sholes and Glidden. In Denver he bought an Odell. In Grants Pass, Oregon, Dietz got his hands on a Yetman transmitting typewriter, and in Knoxville, Tennessee, he found a Corona 3. Under the stairwell of a basement store in Philadelphia he unearthed a Peoples. Where Dietz's modus operandi did differ greatly from today's typewriter collectors was in his "advertising". Whereas, increasingly since 1995, collectors have relied heavily on eBay to find typewriters, Dietz had a very effective way of getting folks to "dust off that old banger". In most cases, I guess, they might not have even thought of selling an old typewriter until he came along. 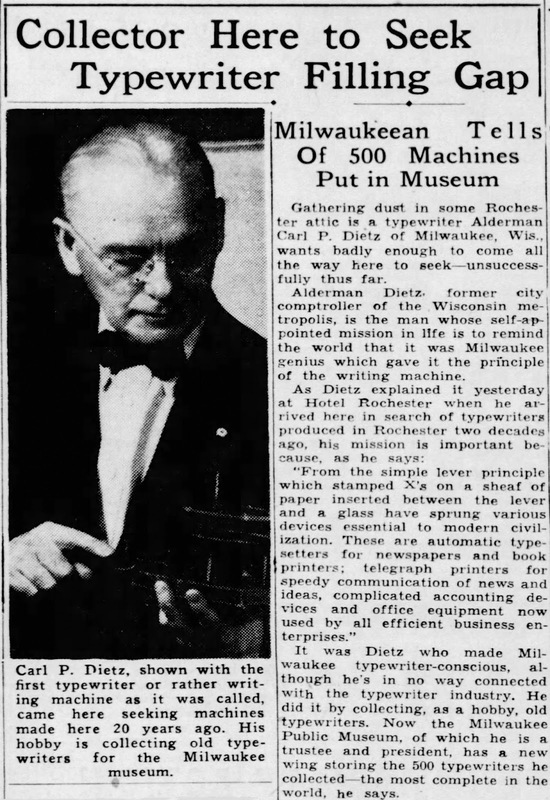 Whenever Dietz was making out on one of his typewriter-seeking ventures, he would let the local newspapers know. Such was the curiosity value in Dietz's "hobby" and his visits, the newspapers invariably ran advance notice that he coming to town, or at least publicised his presence in town. This seems to have worked a treat. Dietz was only once knocked back - in Alexis, Illinois, by the owner of an Alexis typewriter (now in the possession of Flavio Mantelli). One of Dietz's finest scores was swapping two kegs of Milwaukee beer for a Bennett in Brownwood, Texas, in late March 1935. Typewriter dealer J.A.Collins agreed to give Dietz the Bennett in exchange for the beer, to be consumed at an American Legion gathering in honour of Collins in a dry city and in a dry state - the bold denizens of Brownwood could only drink alcohol if it was shipped in. Dietz was duly toasted at the shindig! Dietz was born in Newark on September 19, 1875, and attended Milwaukee public schools, a boys high school in San Francisco (where he was father was United States Conference of German Baptist Ministers general missionary) and the German-American Academy at Rochester, New York. Dietz then worked in law for three years in San Francisco before returning to Milwaukee, where he died on October 29, 1957, aged 82. Donald Hoke at the MPL in 1982. Apart from typewriters, Dietz left behind this scale model of the Kleinsteuber workshop on West State Street, Milwaukee, where Christopher Latham Sholes (seated right), Carlos Glidden and Samuel Willard Soulé had worked on the earliest prototypes of the typewriter. Although, unlike Dietz, Percy Smock was actually involved in the typewriter business for many years - 57, to be precise - unlike Dietz he seemed to be that little less knowledgeable about the old machines he owned. 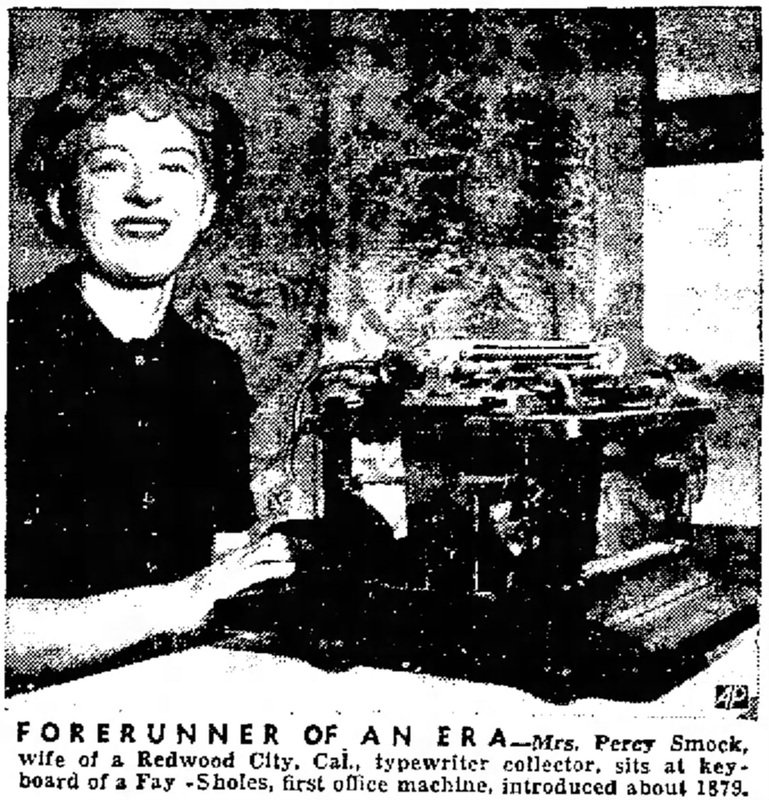 The caption with the Associated Press image of his second wife, Maxine Smock, at a Fay-Sholes typewriter, which appeared in newspapers across the US in August 1951, suggested the machine was dated to 1879, when at best it was a 1901 model. Percy's first wife, Ruth, died in a fall at her home in 1940. She had been in a car crash a year earlier - when her own husband was driving the other car! 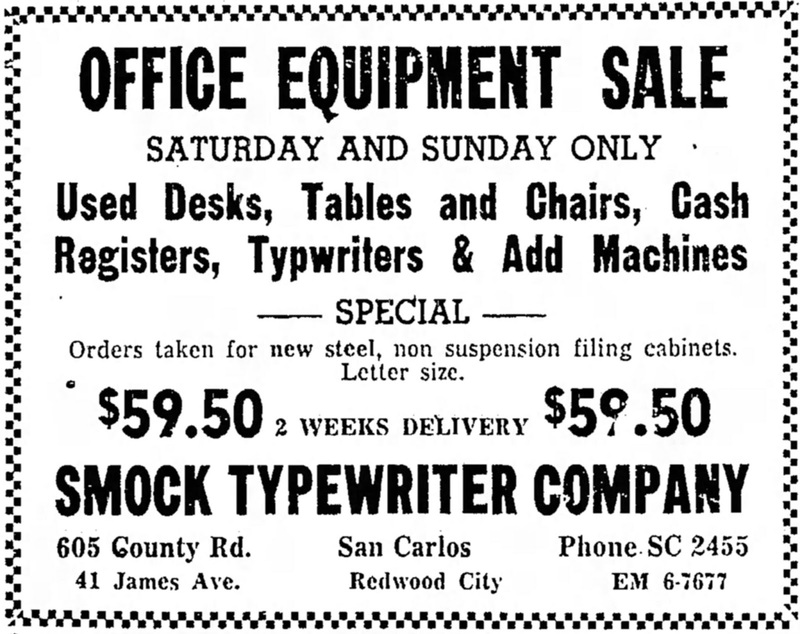 Percy Smock ran the Smock Office Equipment Company at 1034 El Camino Real (the "Royal Road") and lived in San Carlos. Regardless of his business address, and his appearance in Bruce Bliven's Royal Typewriter Company-backed 1954 book The Wonderful Writing Machine (see photo at top of post), he specialised in Smith-Corona typewriters (and in the 1970s Adlers). Before the war this had been E.E. Hunter's Office Store-Equipment Company, for which Smock was a long-standing salesman, typewriter technician and foreman. 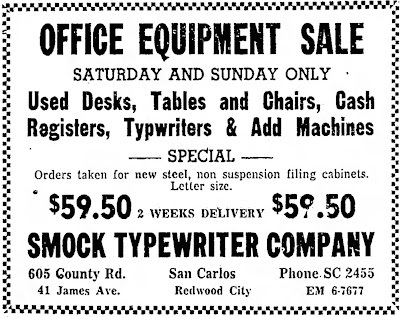 It became the Smock Typewriter Company in 1947. Smock started out as a typewriter mechanic in 1922, aged 18. Smock was born in Campbell, Santa Clara, on March 17, 1904. He died at San Mateo on July 7, 1979, aged 75. Wonderful report Robert. I've read about Smock, but this is the first I've heard of Dietz. At last I know something now about Percy Smock! Priceless. Thank you for passing this along. It is too bad they don’t know the REAL collecting rationale about Dietz. He never would have collected typewriters without the influence and “push” from another local politician and the Sholes family. If not for them, the Dietz collection would be general Americana, 200 sets of ice skates, 70 bicycles and a group of telephones, not the typing machines we all know. I was going to post this info in the comments for the article but am blocked from posting by the Museum’s security and account parameters. I'm not certain what Milwaukee politician provided this 'Push,' but I'll see if I can find out more. If you contact me via email, I would be happy to pass along Al's email address, if you'd like to converse with him directly. Sounds to me like he might have been referring to Frederic Faries Heath, a fellow Socialist politician, journalist, historian and friend of the Sholes family (Zalmon in particular). The claim strikes me as a bit mealy-mouthed. It would be very difficult, for me at least, to reconcile the enormous amount of personal expense, time taken over more than two decades, the effort, commitment and dedication of Dietz to this task as coming from a man being "pushed" to do it. I've been pushed to do things, too, and have done them, but never with this level of personal cost! It would take a lot more explaining than simply saying he was "pushed" to be able the pigeonhole this as the "REAL collecting rationale" behind Dietz's work. BTW, have you read Michael Horne's lengthy 2011 Milwaukee Magazine article about his dealings with the MPM staff over the bicycle collection? A bit of an eye-opener, I must say! No mention there, either, of Dietz being "pushed" to collect this stuff. Your assessment is probably correct, although I'm intrigued by Muchka's comment. I'll see if I can find more. I did read Michael Horne's Milwaukee Magazine article. As you know, a very similar article could be written about the typewriter collection. It is a real shame that these valuable collections are locked away, gathering nothing but dust. I know that proper display of these collections would be costly, but something should be done. As a minimum, they should provide on-line information and photographs. As an aside, I've been working on a book about Milwaukee's industrial heritage - focusing on the century that begins with 1850. As you might imagine, the development of the typewriter will be prominently featured. Also includes a good deal of information about the City's early bicycle companies, in addition to things like steam engines, airplanes and motorcycles. Working title is, "The Magnificent Machines of Milwaukee (and the engineers that created them." It is indeed intriguing, because Al has been very, very helpful to typewriter historians and to ETCetera over the years. It seemed to me that he has been/is always quick and ready to provide photos and information etc. I've never previously heard of any suggestion that Dietz's motivation wasn't entirely as we believed it to be. Carl Dietz initially was not terribly interested in typewriters. His 1934-35 typewriter collecting binge was instigated by another local politician; Frederick Heath. Heath was a Milwaukee County Supervisor and another history buff like Dietz. Dietz’s interests were largely transportation and general Americana. Heath, however, was much more interested in local affairs especially business and innovation. He was a close friend of the Sholes family and especially trying to promote them and the work of CL Sholes as a Milwaukee businessman and inventor. As the Museum was a City institution Heath had no real influence there so he sought out Milwaukee City Alderman, Carl P. Dietz, and started pushing Dietz to try to get the Milwaukee Public Museum involved in collecting local business innovations. 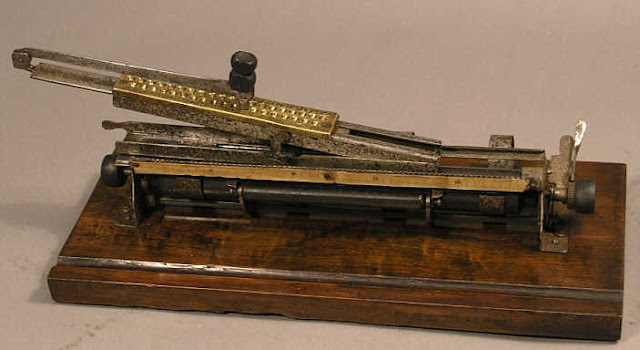 This push triggered Dietz to start looking at the typing machine as a local innovation and Heath made several connections with the Sholes family for Dietz allowing him access to and the ability to collect a few Sholes machines. From there Dietz’s natural collector came out and he began pursuing a variety of early machines showing a more broad view of the development of the typewriter in America and Europe. 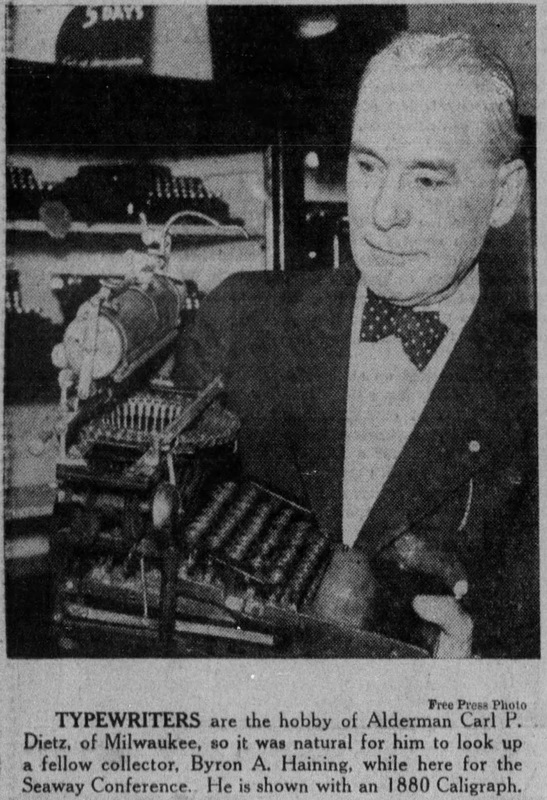 By 1936 Dietz had over 100 machines in his own collection, which in 1936 he gave 112 to the Museum to begin the typewriter collection. Many of those machines were shown in the late 1930s in a museum exhibit. Dietz pretty much stopped collecting typewriters by 1945 and turned back to his first attractions in Americana and collected bicycles, ice skates, and all manner of bits and pieces of Americana, which also wound up in the Museum’s collections. At Dietz’s death in 1957 the typewriter collection was named the Carl P. Dietz Collection in his honor. Thereafter the Museum staff (mainly a scientific assistant named George Herrl) undertook the task of making a catalog as a sampling of the collection. This was published by the Museum in 1965. As you can see, it was Fred Heath, not Dietz who initiated the typewriter collection as a local history project. Without Heath we’d be discussing the Dietz ice skate and bicycle collection. I nominated Heath in my first response. This is a huge call by Al. You could just as easily say Heath's article in the Wisconsin historical magazine resulted in Current's book, except Current did his own research and wrote it himself. He got out and did the hard yards, got the work done. Ditto Dietz. So what's Al suggesting? We call it the Heath Collection? Get real! Al might start by spelling Heath's first name correctly, and checking a few of his figures too.